Sometimes puddings don’t have to be complicated. Yes it’s lovely to spend an afternoon making the perfect dessert every now and again - baking, rolling pastry, perfectly positioning chocolate sprinkles across a gateau but sometimes you just want something quick and easy and, of course, deliciously tasty. While delicious creamy, filling cakes and pies are family favourites when it comes to desserts sometimes a heavy dessert is a little too much. Think of Christmas for example – you feast on turkey and potatoes, vegetables and stuffing and by the time you put your knife and fork down you’re as stuffed as the turkey! The last thing you want is a big slice of gateau or a huge slice of pie. Sometimes what you need is a light, refreshing dessert. Sometimes you fancy something that will cleanse your palette and won’t be as rich or heavy as cake or pie. After a rich dinner a light, refreshing dessert is just the job and this summer pudding is spot on. Fruit is a great dessert, especially after a big dinner and this pudding has just the right amount of sweetness to serve as a delicious pudding as well as being cleansing and refreshing. What’s more this pudding is gluten free and can help you get some of your five a day! What more could you want from a pudding? This recipe serves eight people but if you want to make less just amend the ingredients appropriately. For example if you want to make it for four people just half the ingredients. But remember you can always keep it in the fridge and have it the next day too. It’s so delicious you’re bound to want more! 700g of berries – choose whatever berries you like and try and get a good mix. A great combination is blackberries, raspberries and redcurrants! You’ll also need 500g of bread (gluten free alternative) that is a day old. This is a great way to use it up instead of wasting it and throwing it away! To begin with remove the crusts from the bread and discard. 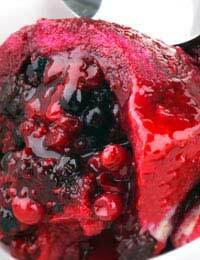 Mash all of your lovely berries in a bowl using a fork or potato masher. You can decide whether you want the fruit like a puree or you prefer it a little chunky. Sprinkle with a little caster sugar and then mix again. Line a pudding bowl with the bread. Start with a slice at the base and then add slices round that sides so that no gaps show. Fill with the fruit puree. You can also experiment with fruit to try different tastes. Go for citrus fruits or try something a little more exotic. This delicious gluten-free summer pudding is quick and easy and absolutely lovely! The illustration for this dessert bears no resemblance to the method, that is, tearing the bread into little pieces and mixing it into the fruit. The picture shows it as it should be. The basin lined with bread with the fruit inside then a lid of bread on top. This was a bid misleading, we've altered the method details to make it a little clearer. Thanks for pointing this out.